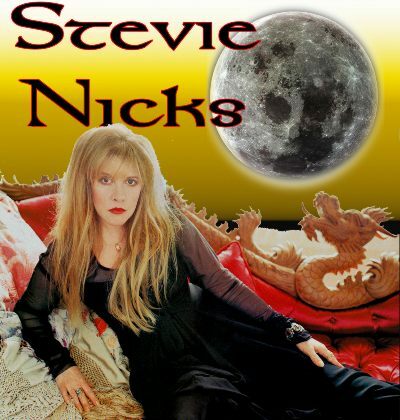 Silly Dreamer Trading "DVD's "
1.1989-One To One Interview w/Stevie Nicks recorded for UK TV.2.1989-BBC Interview. 3.1990-Stevie Nicks Music Box Profile. Outside The Rain/Dreams/Enchanted/Gold Dust Woman/Gold & Braid/After The Glitter Fades/Garbo/Rose Garden/Sleeping Angel/Stand Back/Rhiannon/Band Intros/Whole Lotta Trouble/Landslide/Twisted /Edge Of Seventeen/I Need To Know/Has Anyone Ever Written Anything For You? Stop Draggin, Enchanted, Dreams, Gold Dust Woman, Everyday, Sorcerer, Rhiannon, Stand Back, Too Far From Texas, Fall From Grace, Edge of 17, Need to Know, Has Anyone Ever. This is a rough draft or outtake of Stevies Behind the Music. ItÕs mostly the same as the one they showed, but it has a different narrator and some different clips , different photos, and different interivews (one short one with Waddy at the end!!). This also has the real Behind The Music and Storytellers. Disc 1-Behind the scenes footage from the Japan '77 tour. Includes concert footage & interviews. Stevie talks about her love for Lucille Ball, and does her makeup before a show. Has footage of Stevie & Robin. Disc 2-More backstage footage from the Japan '77 tour. Concert footage, unreleased interviews. Also includes 2 original promos for 'Rumours'. Documentary from the making of Tusk, concert footage from St. Louis 1979. & the Tusk Photo shoot! Mostly A quality Outtakes from the Tusk Doc, extra footage of Stevie and Lidnsey working through Angel is very cool! A 30 minute special with a behind the scenes look at the making of the "Say You Will" album, Interviews with all 4 members of Fleetwood Mac (Stevie, Lindsey, Mick & John) and includes backstage footage shot at the first show of the tour on May 7th,2003 in Columbus, Ohio at the Schottenstein Center. A 60 minute special with a behind the scene look at the band Fleetwood Mac. This video contains live footage from 1982 ("The Chain"), 1975 ("Rhiannon") and several tracks from 1997's video "The Dance". There are interviews with all 5 members of Fleetwood Mac about very subjects, These interviews appear to be very recent. Second Hand News (Boston 2003, shown on US TV, NYE 2003), Peacekeeper (video), Live Interview on Good Day (2003), Live in Interview on Yahoo (2003), Go Your Own Way (live, Today Show 2003), Peacekeeper (live, Today Show 2003), Say You Will (live, Today Show 2003), Peacekeeper (Leno 2003), Say You Will (Leno 2003), Paper Doll (video), Skies The Limit (video), As Long You Follow (video), Little Lies (video), Everywhere (video), Seven Wonders (video), Big Love (video), Hold Me (video), Gypsy (video), Tusk (video), Sara (live '79), Silver Springs (live, Dance), Go Insane (live, Dance), Landslide (live, Dance), The Chain (live, Dance), You Make Loving Fun (live, Dance), Sisters Of The Moon (live, Mirage), The Chain (live '79), Tusk (live '79), Angel (Tusk Tour Doc), Go Your Own Way (rosebud), Dreams (rosebud), I'm So Afraid (rosebud), Rhiannon (rosebud), Rhiannon (Midnight Special), World Turning (Midnight Special), Dragonfly (Beatclub), Man Of The World (Beatclub), Albatross. BONUS: Got A Hold On Me (video), Love Will Show Us How (video) 60 picture slideshow. Peacekeeper video, Holiday Road video, Here Comes The Sun live, Go Insane Video, Soul Drifter video, Trouble video, Slow Dancing video, It Was I video, Countdown video, Wrong video, Bwana SNL, Trouble SNL, Interview, Peacekeeper Leno, Say You Will Leno, I'm So Afraid live The Dance, Big Love live The Dance, Go Insane live The Dance, Landslide Letterman, Big Love Letterman, Go Your Own Way live Rumours 1977, Interview, World Turning live Midnight Special, Dreams video, Big Love video, Tusk video, Hold Me video, Seven Wonders video, Little Lies video, Gypsy video, Today show performances and interviews, Lindsey pictures with Red Rover music in background. Includes the "ABC in Concert" with studio performances, Videos and interview clips with host Sara Jessica Parker. Also includes the "VH1 to 1" interview. Thanks for visiting my Trade Page and I hope you visit frequently. I look forward to trading with you.